South African based Afrobeat sensation Femi Koya the real makoya launches new album “Village Afrobeat” the songs on the album tell stories of what happens in villages and especially fables with animals like tortoise, the role of the town criers, village men and women as part of the whole village lifestyle, songs also depict nature, fertility, rituals, change of seasons and traditions essential to village life. 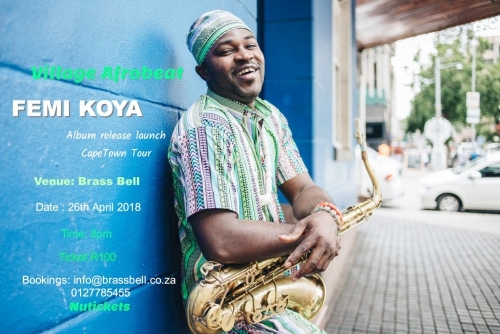 He will be performing songs from the Village Afrobeat album at the Brass bell bringing the African Village sounds to the mother city Cape town. It promises to be an unforgettable Afrobeat night as no dull moment with Femi Koya’s energy.